There are few things as comforting as a nice hot bowl of clam chowder. The delightful aroma of the broth fills your nostrils as you relish in every bite. The creaminess of the potatoes along with the delightful savoriness of the clams make it a truly comforting dish, filling you with warmth and deliciousness. I know, I know. This recipe isn’t particularly low in carbs, but what it lacks in keto friendliness it makes up for in absolute deliciousness. And, as you’ve probably noticed from the title of Clam Chowder with Shrimp, I’ve decided to add shrimp to the mix. If you’ve tried any of my recipes you’ve probably noticed that I can’t seem to leave a recipe alone. But I can assure that the addition of shrimp to the recipe is an absolute delight. 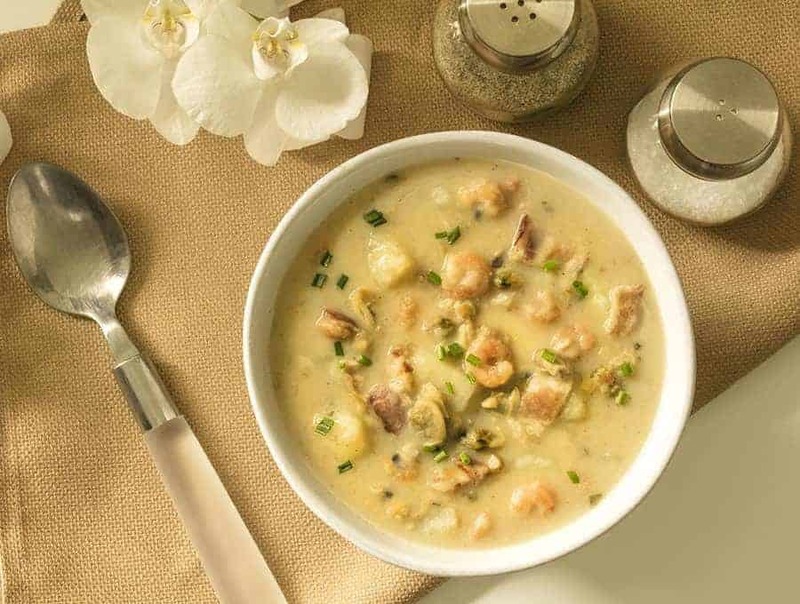 WHY ADD SHRIMP TO THE CLAM CHOWDER WITH SHRIMP? I mean, the short answer is that it’s delicious. But I will tell you what gave me the idea. When Roger and I first met, we went to Oregon Beach. It was an absolutely magical time in a beautiful place. Out on the beach was a little shack that served something called slumgullion. I had no idea what it was–which of course meant I had to try it because I love trying new things. Out comes this HUGE sourdough boule, filled with clam chowder–sprinkled with perfect, tiny, pink shrimp on top. You take a spoon, you mix it all up, and you have at it. 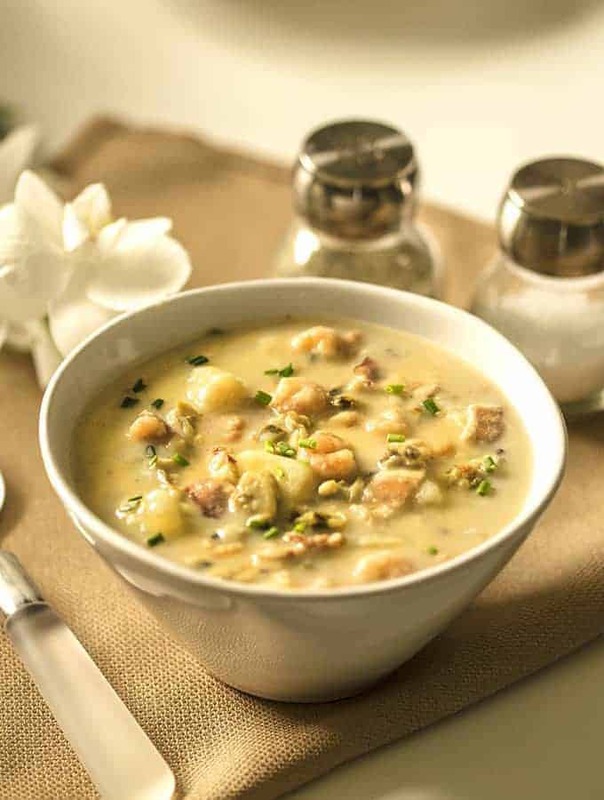 So I’ve been wanting to make a Clam Chowder with Shrimp for ages. The only thing is, I can’t be bothered with fiddly recipes where you brown the bacon, cook the potatoes, then you add this or that… I need one pot, pour and cook recipes so that I can finish cooking without getting distracted by a shiny object. So I finally got around to it, and here we are. The best part of all this is that it’s super easy to make thanks to your Instant Pot. The Instant Pot makes the recipe painless and quick while infusing the soup with a flavor that only a pressure cooker can. I just love it when my Instant Pot can make one of my favorite recipes even easier to make! And talking about easy instant pot recipes, this Pressure Cooker Shrimp Risotto is to die for and is made in under 30 minutes! If you’re looking for a low carb option. 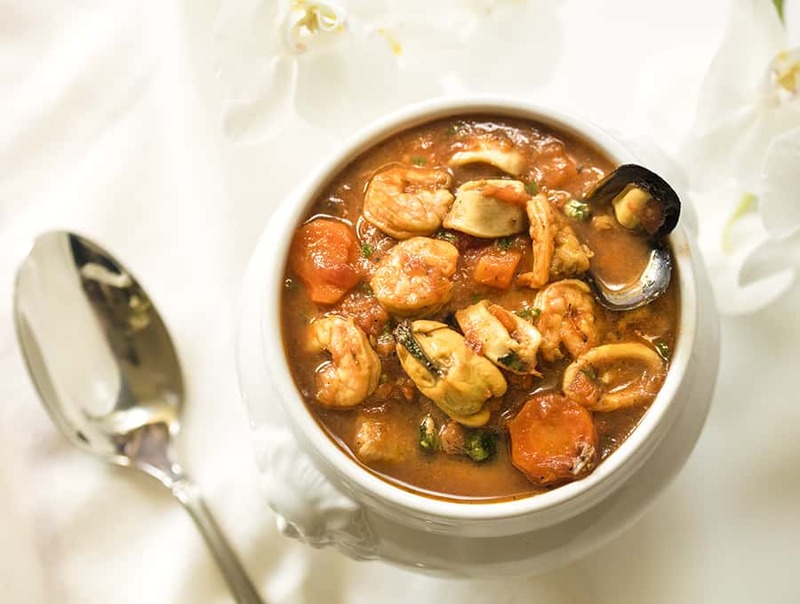 check out my delectable Instant Pot Cioppino Seafood Stew! The great thing about all these recipes is that they’re made faster by your Instant Pot! And who doesn’t like shorter cook times? 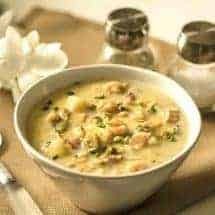 This Pressure Cooker clam chowder with shrimp will cook in under 30 minutes, and it is pretty much a pour and cook recipe. Try it and tell me what you think! Place bacon, onions, potatoes, thyme, bay leaves, salt, pepper clam juice and water into the inner liner of the Instant Pot. Set Instant Pot on high for 6 minutes. At the end of the cooking time, release all pressure. Use a potato masher to roughly mash and thicken the soup. Turn the Instant pot on Sauté. When it is hot, add the cornstarch and water mixture and bring the soup to a boil to thicken. Once it boils, pour in clams, shrimp, the cream and fresh parsley. Stir and allow it to cook a minute or two to heat through, and then serve. My mom made a clam chowder w shrimp but except for the bacon and onions she just opened cans of cream of potato soup, clams and baby shrimp. So I can’t wait to try your recipe! I have 4 guys in my house so I know I will have to at least double the recipe. How many servings does this make?